Dunkin' Donuts wants to open 9,000 new stores. It's an ambitious goal for any retailer in this climate. And it might seem especially bold for Dunkin' (DNKN), which said this summer it is drastically slowing expansion plans. But scaling down while refining a new concept and then ramping up was always the brand's plan, said R.J. Hottovy, an analyst who covers the brand for Morningstar. Over the summer, Dunkin' said it would pare down its menu at some locations, remodel stores, bring in new equipment and sell more food in supermarkets and other non-Dunkin' locations. The company has already started slimming its menu, and plans to continue to do so. "I'm sure they tested aspects of new concept to give them more confidence about expansion plans," Hottovy added. 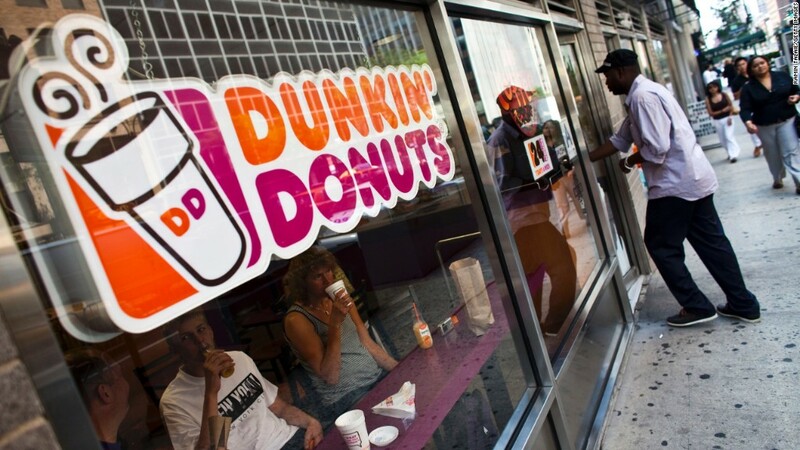 The plan has given Dunkin' Donuts the confidence it can pull off doubling its stores, "unlike most companies in this sector," Dunkin' Brands (DNKN) CEO Nigel Travis said at the ICR conference in Orlando on Tuesday. Travis didn't give a time frame for launching the new locations. 18,000 Dunkin' Donuts isn't a joke -- that would be a lot of stores. That would put it far ahead of 7-11, which has about 8,300 U.S. stores, and Starbucks, which has nearly 14,000 stores in the United States. Although doubling the number of locations is a big undertaking, R.J. Hottovy, an analyst who covers the brand for Morningstar, thinks Dunkin' can pull it off -- if the chain does it right. One way to do that is by focusing on building new locations with drive-thrus. "We think the drive-thru can be taken to a new level, and that's what people want," said Travis. Leading Dunkin's drive-thru business is David Hoffman, who left McDonald's to take over as the doughnut chain's president in 2016. Hoffman's perspective as an outsider with years of experience, Hottovy noted, bodes well for Dunkin's success. And Dunkin' recently announced another McDonald's veteran, Rick Colón, as senior vice president of operations and development. "I think they've got the right team," said Hottovy. Dunkin' thinks drive-thrus will help lure in customers rushing to pick up coffee on their way to work. He expects the company to unveil more about its new store concepts during its Investor Day in February. In addition to drive-thrus, those concepts may include smaller stores where customers can pick up items they've ordered in advance. Dunkin' Donuts has jumped on board the casual dining tech bandwagon over the past few years, adding an "order ahead" option in partnership with Waze, gifting through text, and pre-ordering food and beverages through its mobile app. Customers crave that convenience, especially in the morning, said Travis. The company also plans to draw customers to stores with cheaper food and drinks. "We may have been slightly slow to embrace national value but I think we broke through last year," Travis said, pointing to Dunkin's daily deals and $2 wraps. "You're going to see a lot more value coming out of our proposition over the next several months," he said. So far, Dunkin' has been able to edge out some of its coffee competitors. Last year, Dunkin's business jolted on good earnings results, while Starbucks (SBUX) struggled because of problems with its app. Although it's scaling back its food offerings, it's honed in on coffee. Last year the brand ditched its Coolatta iced coffee beverage for the "more authentic" Frozen Dunkin' Coffee and tried out nitrogen-infused cold brew. And Dunkin's franchise-based model makes it easier than other retailers to add locations -- and makes investors feel more confident in their ability to do so.